Solid Nylon Construction - Made to last throughout college! When you're looking for the ideal college dorm laundry hamper, know that not every hamper for college is made equally. Sure, it's a basic dorm item, but the humble laundry hamper for college is worth taking a closer look at. 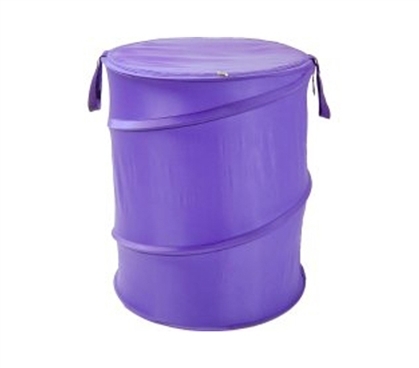 If you choose this Purple Bongo - Durable Dorm Laundry Hamper you'll enjoy some extra features that most dorm laundry hampers lack. For example, this hamper for college students has a lid. More than just a handy feature, a lid can be the difference between a normal dorm room and one that smells like old, dirty laundry. We think we know which one you'd prefer. Having a lid on your dorm room hamper also provides a nice way to gauge; if you can't close your hamper, you're overdue for laundry day! This cheap laundry hamper can also compress flat for when you need to store it. Hampers can be somewhat bulky college items. Yet when it's time to move out, you'll appreciate how easy it is to flatten this laundry supply and pack it right up. When it's not compressed, the durable nylon fabric will have no trouble carrying a mound of dirty clothes. Unlike some cloth laundry supplies, nylon won't as easily absorb odors, ensuring a scent-free laundry hamper. Smelling like nothing is exactly how your college hamper should smell, after all!